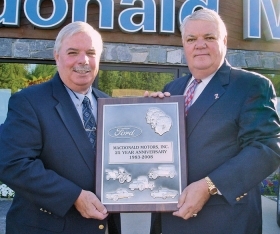 Robert Macdonald, left, and Daniel Macdonald of Macdonald Motors in Conway, N.H., received a 25-year award for Ford from Ford Motor Co.
Bill Marine, left, of Bill Marine Ford in Wilmington, Ohio, receives a 50-year award for Ford from Greg Wood, Ford Motor Co.'s Cincinnati regional manager. 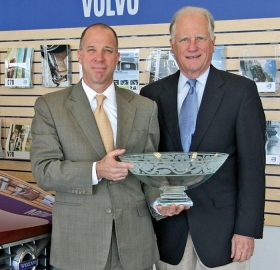 David Stadel, left, and Robert Stadel Sr. of Stadel Volvo in Lancaster, Pa., received a 50-year award for Volvo from Volvo Cars of North America. 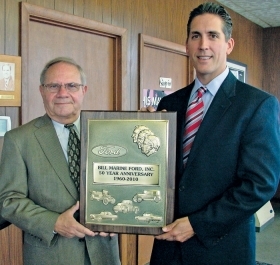 David Stadel is president, and Robert Stadel is chairman.